Intel recently released its server focused C246 chipset to the market to supplement the release of the entry-level Xeon E-2100 series of processors. On that day Supermicro released four different C246 models onto the market including the X11SCA-W which we are taking a look at today. The Supermicro X11SCA-W has support for up to 64GB of ECC and non-ECC memory, eight SATA ports, dual M.2 and a single U.2 port. The goal here is for a good run-of-the-mill Xeon E motherboard. Earlier this year, Intel launched their Coffee Lake based Xeon E processors onto the market, and then re-released them with a server angle more recently. The processors are mirrored analogues of the desktop range of Coffee Lake SKUs, but with ECC support and different efficiency points. The major caveat to using Xeon E is that users will need to adopt the Intel C246 chipset, rather than the consumer chipsets. To complement this new Intel launch, Supermicro released four models: the X11SCA, X11SCA-F, X11SCA-W and X11SCZ-F. The differences in model numbers are very easy to distinguish with Supermicro publishing their product naming convention on their website. The model we have in hand is the X11SCA-W which according to the above naming convention denotes that this model is from Supermicro's 11th generation of workstation boards, it has a single socket, the socket type is Socket H (aka LGA1151 v2), it's a workstation board and that this model has integrated Wi-Fi. 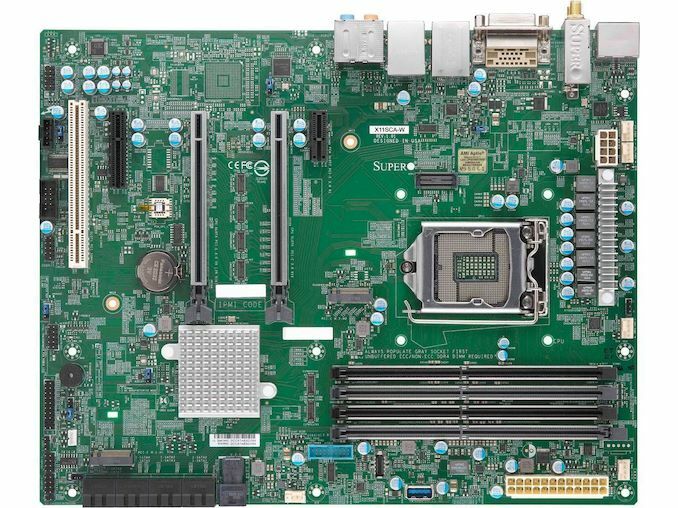 The Supermicro X11SCA-W on the surface looks like any regular consumer-focused commercial motherboard with a basic green PCB. The X11SCA-W has support for ECC and non-ECC unbuffered DDR4-2666 up to 64GB, as well as support for both Xeon E CPUs and consumer Core processors. On the PCB are two full-length PCIe 3.0 slots which allow users to operate graphics cards at x16 or at x8/x8, as well as a single PCIe 3.0 x1 slot, a larger PCIe 3.0 x4 slot and a single PCI 32-bit slot with support for up to 5 V. The X11SCA-W has a pair of PCIe 3.0 x4 M.2 slots but unfortunately they both share bandwidth with other slots; M.2_1 shares bandwidth with the PCIe 3.0 x4 slot, while the M.2_2 slot shares bandwidth directly with the single U.2 port. Located towards the bottom right-hand corner of the PCB is a total of eight SATA ports with support for RAID 0, 1, 5 and 10 arrays. Coming from a range of products aimed at commercial users, the X11SCA-W uses a Realtek ALC888S audio codec, dual 1G Intel based LAN, and 802.11ac Wi-Fi. The board has three video outputs; a DisplayPort, a DVI and HDMI. USB capability is quite basic with two USB 3.1 Gen2 ports (Type-A and Type-C) and two USB 3.0 Type-A ports. When comparing performance, we combined the Supermicro X11SCA-W with an Intel Xeon E-2186G processor. With six cores and twelve threads, a base frequency of 3.8 GHz and a turbo of 4.7 GHz, this is very similar to the Intel Core i7-8700K we use on our other similar LGA1151 v2 systems. Performance in our power testing did show the X11SCA-W to have one of the lowest power draws in our long idle test, but things changed quickly when at full load. Other elements of system performance including DPC latency and POST times also came in quite weak, but booting times on server boards are usually higher than regular consumer boards so this can be overlooked. 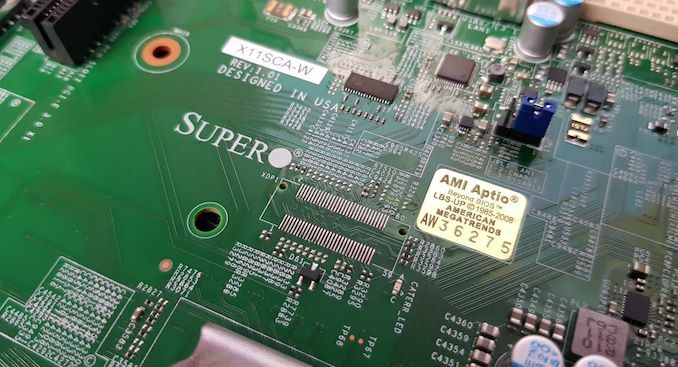 The performance in the CPU, memory and our gaming tests proved fruitful for Supermicro as the X11SCA-W didn't flag up any aberrations and there are no real areas of concern. Supermicro doesn't have much competition in the way of consumer targeted C246 chipset motherboards. ASUS recently released two options, the ASUS WS C246 Pro ($254) and ASUS WS C246M Pro ($251). ASRock did announce one of the first micro-ATX C246M motherboards but the availability of this model doesn't seem to have transitioned to retail shelves as of yet. The Supermicro X11SCA-W has a current selling price of $285 at Newegg at the time of writing with the base model from Supermicro (X11SCA) retailing for $270 which drops the Wi-Fi and Bluetooth 5.0 support. As we reported back in July, Intel is coming out with a range of quad-core and six-core parts for Xeon E. Those labeled with ‘G’ at the end of the name will have integrated graphics. Sitting at the top is the Xeon E-2186G, a six core processor with a TDP of 95W, a base frequency of 3.8 GHz, and a turbo frequency of 4.7 GHz. In the past, the top processor was often called the ‘E3-1285’, so the naming scheme follows. Heh, decided to drop the pretense and just cut straight to the troll? Anyway, as cool as it would be to have an authentic Zeon motherboard, the Principality of Zeon won't be founded (or at least declare independence) for another 161 years. Oh boy. In case anyone actually believes you, no, this had nothing to do with AMD and all servers affected were from time period before Ryzen/EPYC released. I'm going with "unlikely but plausible". There are easier, cheaper, more reliable firmware hacks to get the same result, and are easier to hide than an actual physical component. The other rumored hack that puts the spy chip in between board layers makes more sense but is even more difficult to pull off, requiring the board designer to be in on it. Did you read the article and npz posts & links?